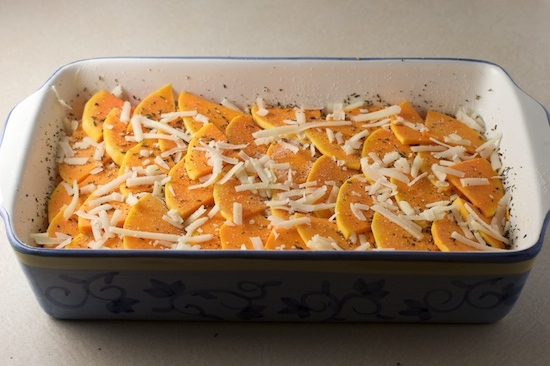 This rich and creamy Butternut Squash and Sweet Potato Gratin is flavored with garlic, fresh thyme, and Manchego cheese. The ingredients are simple but indulgent, making this a perfect side dish for your next holiday meal. It seems like we just finished eating a huge Thanksgiving meal and it’s already time to start thinking about Christmas dinner. Between the big holiday meals and all the Christmas baking I plan on doing, I think I’ll have to ask Santa for some larger clothes this year! But hey, that’s what New Year’s Resolutions are for, right? I’ll worry about dieting in January. 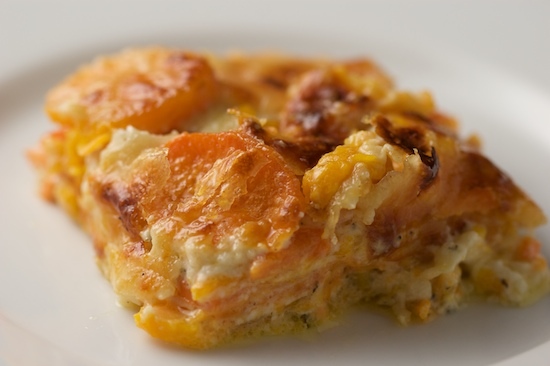 I made my first Butternut Squash Gratin for Thanksgiving 2007, and although everyone seemed to enjoy it, I really thought it was kind of boring. That dish was made with butternut squash, heavy cream, fresh thyme, and Gruyere cheese. I know, it sounds good. But it was just lacking something. Although I never tried making a different version, it’s always been there at the back of my mind, waiting to be revised. 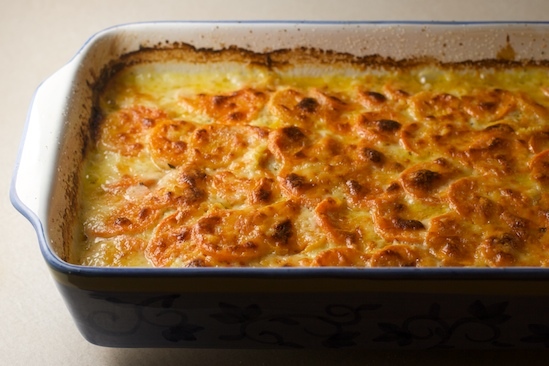 Since I’ve been doing a lot of experimenting with sweet potatoes in savory dishes lately, I thought it might be fun to add some sweet potato to the Butternut Squash Gratin to liven up the squash a bit. I also added some garlic to the cream and used fresh sage in addition to the thyme. The first version tasted really good but I decided I didn’t care much for the sage. I loved the addition of the garlic and I thought the butternut squash and sweet potatoes went together nicely. The sweet potatoes added a great punch of flavor and just a bit of sweetness that really perked up the dish. The final version of the recipe is still very simple, but the garlic and sweet potatoes give it that something extra I was craving. And I really love the Manchego cheese (that idea came from EAT). I think this would be a great side dish for either Thanksgiving or Christmas as I think it would go nicely with just about any type of main course you could dream up. Although it might be a little too rich for anything but a special occasion, I do think most of us can handle a dose of heavy cream during the holidays! 1. Get Ready: Preheat oven to 400 degrees. In a small pot bring cream and garlic just to a simmer. Remove from heat and set aside. Butter a 9″x13″ shallow casserole dish or gratin dish of similar size and set aside. 2. Prepare the Ingredients: thinly slice the squash and sweet potatoes (no more than 1/8 inch thick) and keep them separate from one another. 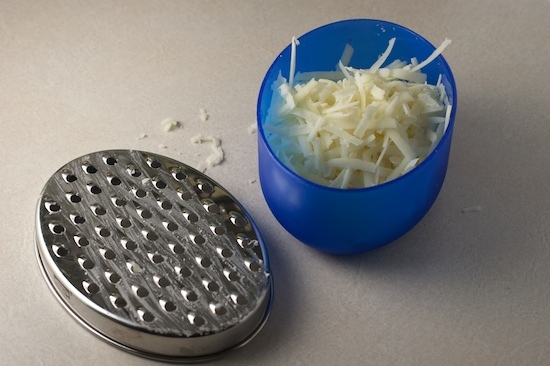 Measure out chopped thyme, salt, pepper, and shredded cheese and have them handy. Stir the cooling cream to help prevent skin from forming. 3. 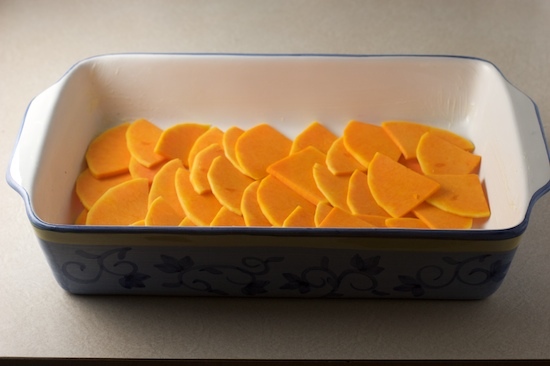 Build the Gratin: In the buttered casserole dish, spread half of the sliced butternut squash out in a single overlapping layer. Sprinkle the squash with 1/3 of the salt, pepper, and thyme and then about 1/2 cup of the grated cheese. Using half of the sliced sweet potatoes, build a new overlapping layer. Again sprinkle with 1/3 of the seasonings and 1/2 cup of shredded cheese. 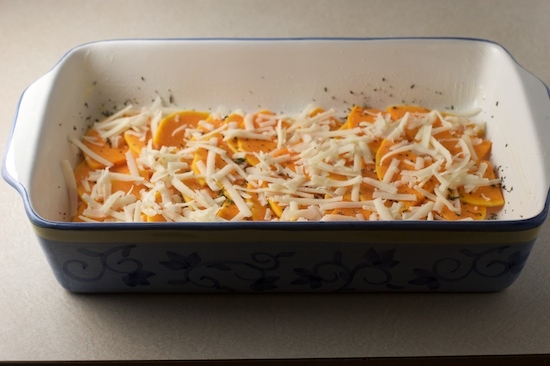 Using the remaining squash, make another layer and sprinkle the last third of the seasonings and another 1/2 cup of cheese (you should have about 1/2 cup cheese remaining). Use the last of the sweet potatoes to make one final layer on top. Stir the garlic cream mixture then pour it evenly over the top of the gratin, being sure to cover the top layer of sweet potatoes. Shake the dish gently to distribute the cream. Sprinkle the remaining cheese over the top. 4. Bake the Gratin: Cover the dish with foil and bake in the middle of a 400 degree oven for 30 minutes. Remove the foil, move the gratin to the top 1/3 of the oven and bake, uncovered, for an additional 20 minutes or until the top is nicely browned and the vegetables are tender when pierced with a sharp knife. You may also place it under the broiler for a few minutes if you wish the top to be a deeper brown (but watch it closely!). Remove from oven and let cool for 30 minutes before slicing. Recipe Notes: *I used the neck of a medium butternut squash and quartered it lengthwise. Butternut squash can easily be peeled with a vegetable peeler. Measure out one pound of squash after it is peeled and the stem has been removed. Save the remaining squash for another use. **Peel the potatoes and remove the pointy ends (save them for soup!) so you’ll have more uniform slices. You need about one pound of prepared sweet potato. 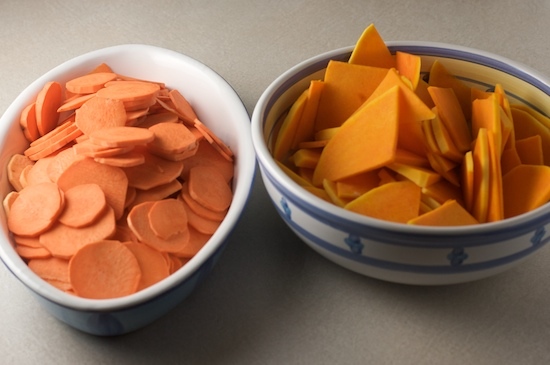 Squash and sweet potatoes should be thinly sliced, no more than 1/8 inch thick. You will need about 2 cups of shredded Manchego Cheese. If you can’t find Manchego, you may substitute Gruyere. Get your seasonings ready. 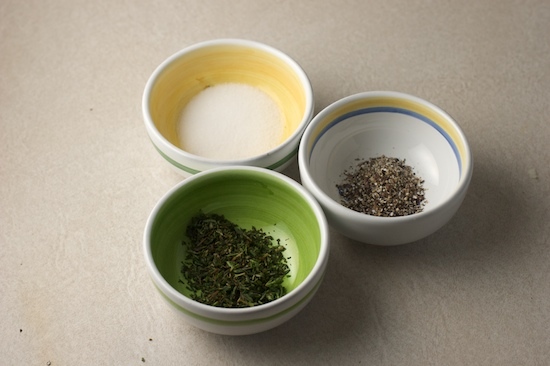 You’ll need chopped fresh thyme, salt (preferably kosher), and fresh ground black pepper. Use half of the butternut squash slices to form a single overlapping layer in the bottom of a greased 9×13 casserole dish (or use a similar sized gratin dish). Sprinkle the squash with 1/3 of the salt, pepper, and thyme then sprinkle with about 1/2 cup of cheese. Now use half of the sliced sweet potatoes to form another single overlapping layer. Now sprinkle with another third of your seasonings and another half cup of shredded cheese. Use the rest of your butternut squash slices to form another layer. This should be your third layer of vegetables. Now sprinkle the remaining third of your seasonings and another 1/2 cup of cheese. You should still have about 1/2 cup of cheese remaining. Now use the last of the sweet potatoes to form the top layer of the gratin. Pour the garlic-infused cream evenly over the top of the sweet potatoes. Finally, sprinkle the top of the gratin with the remaining shredded cheese. Feel free to add a little extra if you have it! 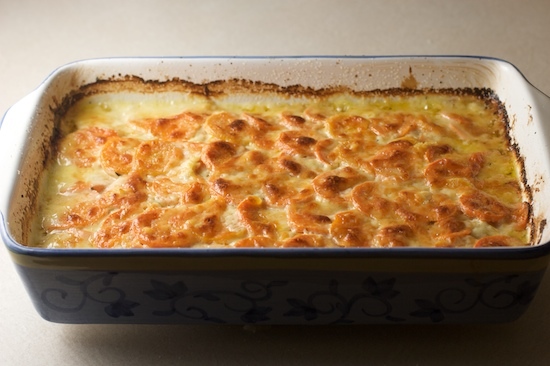 Bake the gratin, covered with foil, in a 400 degree oven. After 30 minutes, remove the foil. It should be bubbly and the vegetables should be almost tender when pierced with a sharp knife. 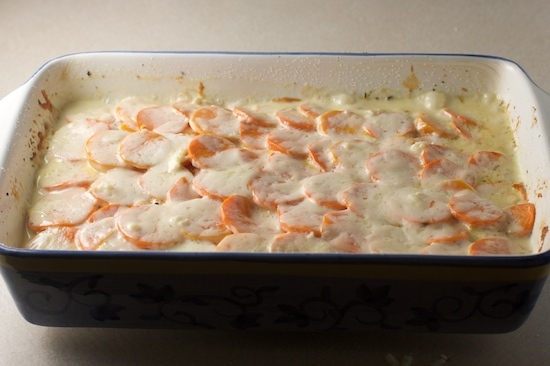 Bake the gratin, uncovered, in the upper third of the oven for an additional 20 minutes or until the top is nicely browned and the vegetables are completely tender. If you want it darker, pop it under the broiler for a few minutes at the end (make sure to watch it closely!). Allow to cool for about half an hour before slicing. Enjoy! I can't believe my good fortune. A friend brought over an acorn squash and three sweet potatoes. I wasn't sure how I was going to use them, but now I know. I'm making this tonight. oh. my. word. i must make & then devour this. Oops - I mean butternut squash. I had never thought about using sweet potatoes this way. looks great. Looks beautiful- and I imagine it tastes delicious! I love sweet potatoes. Can't get enough of them! Yum... fantabulous :) and that half hour waiting for it to cool would be torture!! Bring on those orange root vegetables! I love both squash and sweet potatoes, and of course everything tastes better with cheese. I've bookmarked this one. I want to make this right now, even though it's almost 11:30. I'll have to make it this weekend, especially now that it's so cold outside. It looks perfect. This looks to die for!! I absolutely love butternut squash and the idea to combine with sweet potatoes and bubbly cheese? Love it. That looks really good and creamy! Looks and sounds scrumptious! 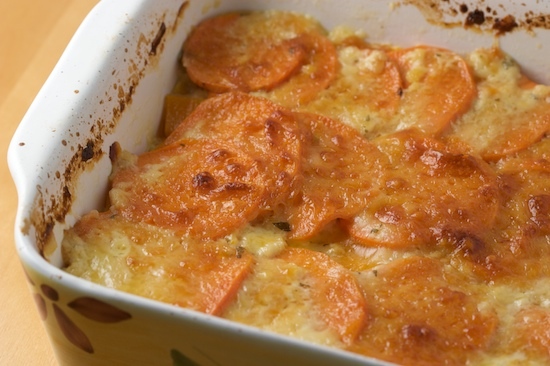 I make potatoes au gratin all the time, both with regular and sweet potatoes, even combined but never have tried it with squash. I think I will give it a try for the family over the holidays! Thanks for reminding me of this! Living in Italy, sometimes I forget my old favorite comfort foods, in Tuscany, using cream in cooking in pretty much a no-no, but I think I will sneak this in on my hubby! I will stick to the zucca gialla, sweet potatoes are hard to get here, maybe do potatoes and pumpkin! homework! Nicole - This one one wicked fall gratin! SUPERB! I also love the detailed description of each step with pics, etc. It is very easy to follow your recipes. Also, I digg your gratin and herb dishes. Cheers! Gabi. Oh how yummy. This is perfect for this time of year. 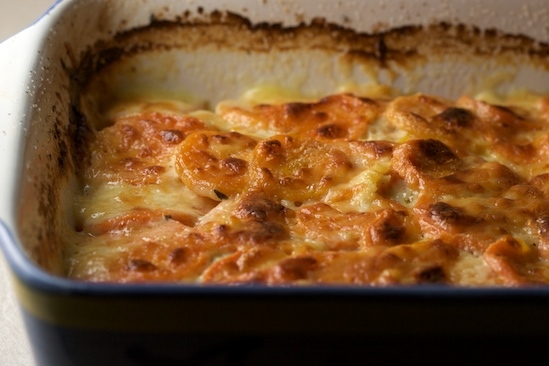 This sweet and savoury gratin looks and sounds so good! That looks sensational I am making it! Yummmmmmm. I made this for a dinner party on Saturday night. I popped it into the broier for a few minutes while I tended the asparagus and chicken. Completely forgot about it until smoke started wafting out of the broiler. I had to peel off the charred layer, but it was STILL delicious. Can't wait to make this again without the charcoal top! Oooh, looks delicious. But I'm always scared I'm going to cut of my arm when I'm cutting up raw butternut. We had this for dinner tonight -- of course my mom made it, not me -- and it was soooo good! Really really good! I loved the butternut squash and sweet potatoes together in the dish. Everyone should try this one. I just made this for dinner this evening and it was *so* good! Definitely a keeper! this looks like a true crowd-pleaser! i plan on sharing this at a turkey fry potluck this weekend. thanks! I cooked this for a pre Christmas dinner party on Wednesday night and it got the thumbs up from all our guests. Fab! It is really tasty, thanks for sharing the recipe! I served this with my ham last night to guests for Christmas dinner. What a hit!!!! That is a wonderful combination!!! I'll try some more from your sight. Thank you so much!!! i just wanted you to know that i made this for my family on Xmas eve and it was huge hit. it upstaged the main dish. i love, love, love it. thank you! Looks lovely and tasty. I love your step by step photos, so good for the new cook to learn from and us more experienced cooks too! Cymraes from the Welshmarches. Sometimes those healthy NYE resolutions have to be put to the side. Especially if this dish is on the table! This is really delicious. I have made it twice already. I wanted to turn this into a one-meal dish so I added prosciutto. My kids (2, 4 yrs) and husband (a professed meat-aterian) loved it. The second time around, I used chicken stock (about 3/4 to 1 cup) instead of cream, and ham. Delicious again. This is something I will definitely continue making over and over. And so easy! I have been looking for a recipe like this. Thank you so much for posting this. I love your blog, just stumbled on it. It is so "fresh"
Thank you for an excellent recipe- my wife made this for me and it was tremendous. Hi thanks for the great website! The photographs are so beautiful and it is very entertaining to read your stories. I came across the site yesterday when I was looking for a recipe with chick peas and coriander (discovered your accident-soup). I will definitely try some of your recipes. The recipe above sounds really good. I have recently tried a Waitrose recipe (pasta with butternut squash and sweet potatoe) - quite similar, except that they used rosmary instead of thyme plus onions. Very delicious. Just add the cooked pasta to the grilled vegetables. And if you like dips, I can recommend a ginger-coriander-yoghurt-dip, I discovered here: http://www.bbcgoodfood.com/recipes/1667/baked-aubergines-with-coriander-yogurt-dressing. The aubergines are very yummy, too. My Bountiful Baskets veggies last week included both butternut squash and sweet potatoes, neither of which have I ever cooked. So I was excited to find your recipe that included both! IT. WAS. FABULOUS!!!!! Even leftovers reheated in the microwave the following night! My only comment would be that both the Manchego and Gruyere cheeses were pricey (to me anyway)....I paid $10 for what ended up being just barely 2 cups shredded. So if you're on a tight budget, wait to make this one until you have a little extra to splurge. Thank you for sharing and for including such detailed pictures! I made this dish as one of the sides for Thanksgiving dinner. My houseguest RAVED about it and is taking some home with her on the plane. I will definitely be making this again. Thank you! I have made this butternut squash dish a few times now and everyone loves it. Thank you for this recipe. I tried this recipe and enjoyed it with a nice rib eye steak and roasted asparagus. It was wonderful. Thanks for sharing it! You described it so carefully and the photographs were so perfect that I felt able to do it. Thank you so much! Now it's in the oven and I'm looking forward to sharing it with my partner! My oh my, that was just amazing! We both agreed it was the best thing we'd ever tasted! Thank you for your lovley blog. Great recipe! I prepared everything except the garlic-cream mixture for my boyfriend when I left town, then he did the last step and was gushing how amazing this was. I liked how you gave different variations- it does need some spice or something (from the original version)- have you thought about adding crushed red pepper in between the layers? Very delicious. I have played around with the recipe a few times. I like a little dried sage along with the thyme. I have also used a combination of butternut squash, sweet potatoes, and red potatoes. A dash of nutmeg in the garlic-cream mixture adds even another layer flavor! WOW! Just made this for Thanksgiving, following the recipe exactly, and it was a huge hit, incredibly yummy. Really an amazing, innovative recipe-- thank you for sharing it. Hello, Neat post. There is an issue along with your web site in internet explorer, might check this? IE nonetheless is the marketplace chief and a good component to other people will miss your wonderful writing due to this problem. I found your recipe & it sounded great. I did not have the cheese on hand so instead I tried layering the squash then top with Ricotta mixed with garlic, thyme & mozzerella Sweet potato pour over whole milk simmerd with garlic & Thyme then layer of mozzerella IF YOU ARE MISSING they gryre try it anyhow- still delicious!!! I have not made this ahead of time myself, but I think it would be fine assembled ahead of time. Maybe let the garlic cream cool before pouring it over the top so the cheese doesn't melt until it goes in the oven.